Caps often inhibit the proper eruption of adult teeth and can lead to infected and lacerated gums, tongue, and cheeks. The presence of wolf teeth are often associated with issues related to a bit fit comfortably in a horse’s mouth. Molar hooks are often caused by a misalignment of the upper and lower jaw, and occur on the first premolar of the upper jaw and the last molar of the lower jaw. This is a congenital condition in which the upper jaw is longer than the lower jaw, resulting in the development of hooks on the upper premolars and lower molars. This condition involves a variation in molar height that causes uneven wear and compromised range of motion. These points develop on the outer edge of upper molars and premolars and inner edge of lower molars and premolars. Tartar is typically removed from canines and incisors, and aids in the prevention of gum disease. We recommend examining foals for congenital defects and to confirm normal presence and development of incisors and premolars. 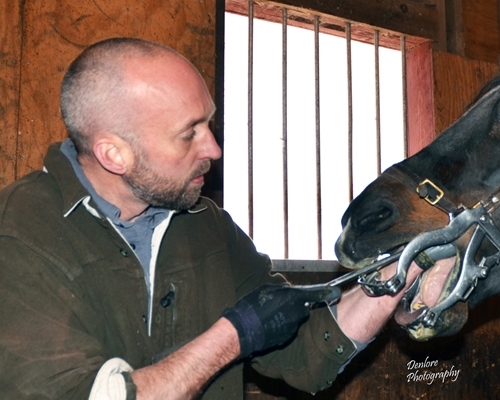 Routine dental care for adult horses should be be provided every 10 months to check for normal wear patterns, full range of motion of lower jaw, and to float (smooth) sharp enamel points. To schedule an appointment, contact Duncan at 802-291-0354 or by email.